If you have been breaking your back in order to get the job done and wishing for there to be an easier way and there is. With the 2018 Ram 3500 at your side you will have a workmate that does all of the heavy lifting for you without care or complaint. The 2018 Ram 3500 isn’t only going to help you get the job done it is also going give a cockpit to relax in after the long workday is done. 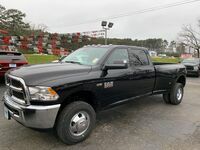 You can get behind the wheel of the attractive and accommodating 2018 Ram 3500 at Cowboy Ram in Clinton, AR today and you can learn all about the engine specs and interior features of the Ram 3500 below. The 2018 Ram 3500 is offered in seven trim levels, the Tradesman, SLT, Lone Star, Big Horn, Laramie, Laramie Longhorn®, and Limited. 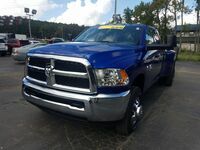 You can also choose between a Regular Cab, Crew Cab, or Mega Cab along with either an 8’ Box or a 6’4” Box. The standard engine of the 2018 Ram 3500 is a 5.7L HEMI® V8 that delivers 383 horsepower. 400 lb-ft of torque, and a 17,520-Pound Max Towing capacity. 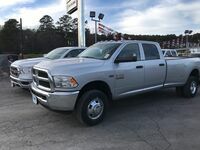 A 6.4L Heavy-Duty HEMI® V8 is an available option for the Tradesman, SLT, Lone Star, and Big Horn trims and it comes standard on the Laramie, Laramie Longhorn®, and Limited trim levels and arms the 2018 Ram 3500 with 410 horsepower, 429 lb-ft of torque, and a 17,440-Pound Max Tow rating. 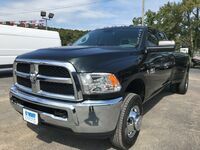 Finally, a 6.7L Cummins® Turbo-Diesel is an option for all seven trim levels of the 2018 Ram 3500 and it cranks out 385 horsepower, 900 lb-ft of torque, and provides a 31,210-Pound Max Tow rating. Standard interior amenities of the 2018 Ram 3500 include a 6-Speaker Stereo w/ Audio Jack for Mobile Devices, Adjustable Seats and Seatbelts, and Rear Under Seat Storage. 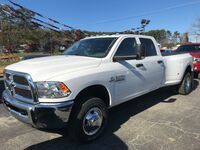 Upgrade to the Big Horn trim level and owners are rewarded with a 5” Color Touchscreen Display, Bluetooth® Connectivity, 1-Year SiriusXM® Radio Subscription, and a Front Center Seat Cushion Storage. The 2018 Ram 3500 Limited gets adorned with an 8.4” Color Touchscreen Display, Apple CarPlay™ & Android Auto™, a 9-Speaker Alpine® Stereo w/ Subwoofer, and Heated & Ventilated Front Seats. 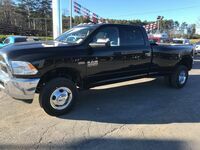 Take the 2018 Ram 3500 for a test drive today at Cowboy Ram and experience its powerful engine options and comfortable cabin features for yourself. 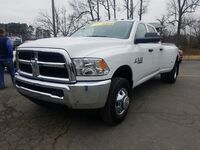 Interested in a 2018 Ram 3500?